We have unique experience in buying, trading and selling estate jewellery. We have hundreds of previously owned items such as: diamond rings, gold coins, bracelets, earrings, pendants etc. Call or visit our store if there is a particular item you are looking for. This 7 stone anniversary ring may not be a cure for the 7 year itch but it certainly can’t hurt. High quality VS-GH, prong set princess cut anniversary rings are not typically seen. Quite often square diamonds like these are channel set. Lifting them up in double gallery settings not only makes them look bigger they actually sparkle more as the edges are not covered up with a seam of gold. It takes far more skill setting square diamonds compared to rounds, if totally parallel without gaps is the intention. The ring looks like new, each of the 16 claws shows no wear of any kind. 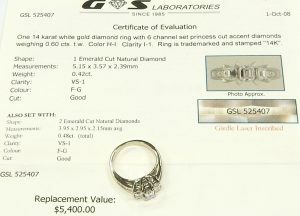 The size 6 1/2 ring weighs 4.0 grams and is accompanied by a July 2005 HKD Diamond Laboratories Canada appraisal for $3,030.00. 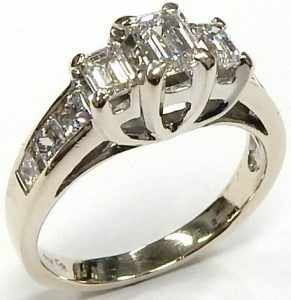 As a like new estate ring we have it estate priced at $1,190.00 CAD. Stock #e12067. This essence of simple and reliable timekeeping can be found on this vintage Rolex precision dating from late 1959. The shock protected 17 jewel Rolex calibre 1210 is running to a slow beat rhythm of 18,000 cycles per hour. The soothing tic tic tic tic tic can easily be heard through the domed plastic crystal. This basic manual winding movement has a very useful power reserve well over 2 days allowing the user the need to wind it up only every other day. Long before there were self winding and electronic watches, wind up technology was the only type available. It’s running great and keeping very good time. Thin tapered hands with arrow head hour markers provide excellent legibility. Blued steel hands were a common feature found on pocket watches from the 19th and 20th century. As pocket watches fell out of favor in the 1930s many watch manufactures still used blue steel hands as they provided great contrast against popular silver and white dials. The simple use of such a second hand is a subtle clue to the age of this watch. The thin profile of this Rolex also reveals the true age to any vintage Rolex aficionado. 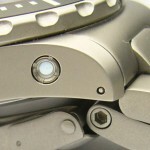 Modern automatic Rolex watches are much more thick and bulky. It is possible to get into a vintage Rolex for under $2,000.00 with this Oyster Precision 6426. The 34mm case is perfect for the gentleman who doesn’t want to be continuously reminded that he’s wearing a giant over sized timepiece. Many woman are wearing this size too for a fun and supremely function alternative to something more dainty. Including a full one year warranty this 60 year old Rolex is estate priced at $1,999.00 CAD. Stock #e12011. Any Rolex is a desirable thing even if it’s a relatively common model. One could argue there really is no such thing as a rare modern Rolex since the company has been producing well over 1 million watches per year since the 1990s. Ladies Datejust 79173 is a model we’ve seen many times at Bill Le Boeuf Jewellers but this one is just a little more unique. The “P” serial number places the production around 2000, nothing too rare about that. What’s interesting is the remarkable condition, make that the brand new condition. Although the Canadian authorized agents endorsed warranty shows June 22 2000 this watch has never been worn. The red chronometer plastic seal tag and green serial number tag have never been removed from the bracelet. Not only is the green case back sticker still in place, the clear plastic sticker over top is still intact along with the red tab buckle sticker. Everything regarding the condition can be described as brand new. The proprietary Rolex 18 karat yellow gold alloy has ever so slightly oxidized becoming slightly darker. Something like this can only happen after many years of sitting idle in the box. A quick wipe with a polishing cloth will restore the true colour but we’ve left it alone as testament to its zero use history. The sharp edged fluted bezel ring synonymous with the brand still twinkles like a finely faceted crystal with razor sharp edges. People who know what to look for will always measure the “horizontal sag” and stretch of the bracelet on any Rolex. No disappointment here as the 18 karat and stainless steel jubilee bracelet is perpendicular with the case back. The always popular traditional champagne dial with hash mark hour markers is still the choice for many Rolex clients. A 26mm 18 karat and stainless steel Datejust model is no longer offered today. The current Rolex Datejust 28mm example of similar specification with run you $10,450.00 CAD and $9,150.00 USD. Every bit of original documentation and packaging comes included. A complimentary one year Bill Le Boeuf Jewellers 1 year warranty accompaniesthis time capsule Rolex. Yes you can easily find the same model for less but it will not be brand new. Without question this is the best condition 20 year old Rolex we’ve ever had. Estate priced at $6,500.00 CAD. Stock #e12090. I say this with utmost respect; here’s a watch that will be really appreciated by only our many watch geek customers. It may not yet be a household name in North America like Rolex, Tag Heuer, Breitling etc. 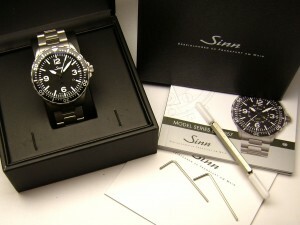 but feature for feature the Sinn 857 pilot leaves many other name brand watches grounded. Of course it comes with the standard features most high quality professional watches have, including a threaded crown, threaded case back, anti-glare sapphire crystal, locking buckle, diver extension, luminous hands and markers. For absolute functionality the flat black aviation style dial with pure white Arabic styled hour markers can’t be beat. The stainless steel case and bracelet have been hardened with a special tegimenting process making the steel many times harder than conventional stainless alloys. Sinn fill the case with an inert gas helping reduce the formation of condensation that can contaminate the vital oils that lubricate the movement. Copper sulfate capsules within the case also contribute with moisture reduction. A small window on the case edge shows the baby blue capsule. If any moisture is encountered it gradually turns a dark blue. The heavy duty bracelet is held together by stainless steel bolts with a hexagonal cap on each end insuring everything stays together. 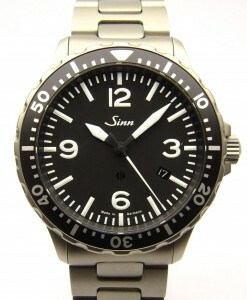 The Sinn website describes this watch as more of a pilot watch than a divers watch, although it is water resistant to 600 feet. A 43mm timer bezel rotates in two directions with 60 precise clicking indexes. If you’re looking for an exclusive brand that you are not likely to encounter at every watch boutique consider the Sinn 857. Comes complete with all the original packaging, boxes, instructions, warranty and even the small tools for bracelet adjustment. Previously owned by a very particular client of Bill Le Boeuf Jewellers who decided he just didn’t need this watch as his other watches saw more use. The flat sand blasted finish shows some minor evidence of use but retains the original factory finish with sharp crisp edges. There is only one North American authorized agent for this watch www.watchbuys.com where they show a price of $2,360.00 USD. Bill Le Boeuf Jewellers just completed a full mechanical overhaul (April 2019) including vacuum testing. The Vibrograf printout shows a gain rate of just 4 seconds per day, well within certified chronometer status. Including a one year warranty the watch is estate priced at $1,890.00 CAD. Stock #e8746.